You'll often see vanilla used as an ingredient in various components and compositions. A standard ingredient in our kitchen, we'll give you more background information about vanilla in this blog. The vanilla pod comes from the vanilla orchid. Vanilla pods are spices used for tobacco, perfume, and food. Although the vanilla orchid originates from Mexico, it is now grown in many other areas in the world. Madagascar is currently one of the largest producers of vanilla. 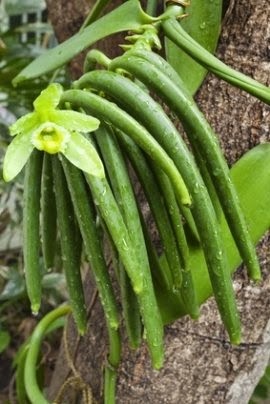 The well-known vanilla pod is the fruit of the vanilla orchid. Although it looks like a bean, it is actually a berry. Vanilla pods are harvested unripe before being 'fermented'. This means they are first heated in water and then gradually dried. The familiar taste and aroma of vanilla develops during this process. Bourbon vanilla is something you'll often come across. It is a more exclusive type of vanilla of a very high quality and originates from the island of Réunion (formerly called Bourbon). You may be interested to know that the largest buyer of natural vanilla (not necessarily Bourbon) is Coca Cola. In 1985, Coca Cola decided to use a synthetic substitute for vanilla, which led to the collapse of the Madagascar economy. Once it was decided to revert back to the previous recipe, the economy started to recover.